Johnny Romeo is an Australian artist, best known for his pop culture idolization and brand-name heroes done in a comic book aesthetics. Today, Johnny is considered one of Australia’s most popular Pop artists, being sort of a leader of Neo-Expressionist Pop movement. His aesthetic collision of r’n’r, comic books, Grindhouse intensity and street art was described by GQ Magazine as part punk, part pop. By fusing together vibrant Technicolour imagery with urban grittiness, this artist manages to create a constructive critique of a modern world we live in today, driven by pervasive advertising and materialism, creating an immense excess of waste. Romeo’s sharp humor explores our identities and the way it is created living in a cultural homogenization, with the constant failure of blind consumerism, media saturation and celebrity fetish. Johnny Romeo creates every artwork with a plan and a purpose: by making extensive sketches in his journals, he gets to use everything he ever found to be curious. As a very visual type, Johnny collects all sort of things he can work with later, using it as a part of his work or just as an inspiration: cuts from the magazines, photos he took, sketches he did on the run… That material represents his thoughts and it eventually becomes his painting! Romeo worked on a collaborative project with American punk band Blink-182, one of the biggest names in rock music today. 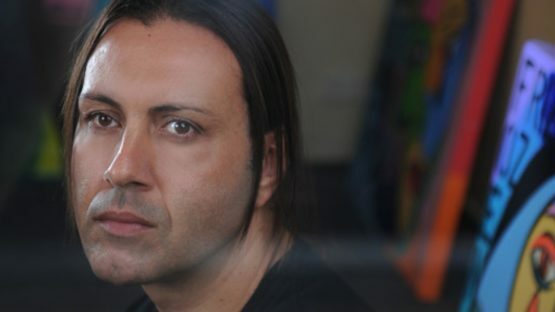 His work is included in in numerous public and private national and international collections as well as publications like the Sydney Morning Herald, GQ Style Australia, Vogue, Grazia or Australian Art Review. This artist is represented by 19 Karen Contemporary Artspace. Johnny Romeo lives and works in Newtown, Sydney.